No f#@%$ Merlot!, Excuse Me Sir My Wine Is Flat, Bears beets Battlestar Galactica, And Other Notes on a Wine Card. Wine cheats department: There’s a big scandal involving the master sommelier exam as reported by Esther Mobley in the San Francisco Chronicle. Got me to thinking on how one goes about cheating on a wine test. Do you affix wine labels to your arms? Do you hide little bottles of wine on you and pop them open during the exam? Do you hide corks under the desk with the answers written on them? Curious minds want to know! Excuse me sir, my wine is flat department: Santiago Navarro of Garcon Wines in England wants you to have flat wine all the time. Flat wine bottles that is. A flat bottle is lighter than a normal bottle of wine, takes up less space, and can hold 750ml. A twelve bottle case of wine in regular bottles weighs about 40 pounds while a flat bottle case of twelve weighs about 22 pounds. To see what the flat bottle looks like, check out the Forbes article here at The Wine Bottle’s Future May Be Shaping Up To Be Flat. Overheard at school department: My son came home from school and said he overheard the following conversation when a teacher’s aide walked into the classroom and spoke with his teacher. Aide: “Question” Teacher: “What kind of bear is best? Bears. Beets. Battlestar Galactica!” My son – a junkie of The Office – immediately recognized the line from the episode where Jim Halpert impersonated Dwight Schrute. We love that show, thank God for Netflix! 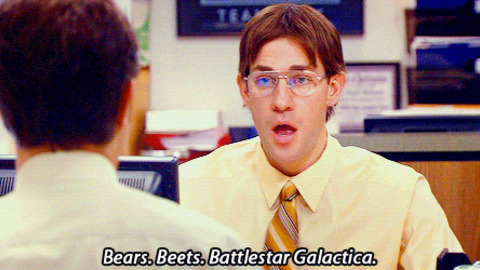 Check out the hilarious scene here Bears beats Battlestar Galactica. I am NOT drinking any (expletive) Merlot! The Last Word: Wine is to women, what duct tape is to men. It fixes everything.